A month's access to the complete Writing Task 2 course (13+ hours). If don't know how to organise essays or write introductions or even what referencing is, then this is the course for you! Let me show you how to write essays that satisfy all of the IELTS marking criteria. A month's access to the Academic Writing Task 1 course (10 hours). Everything you could ever want to know about IELTS reports, including the most effective method ever created for writing Band 7 Overviews. Plus access to hundreds of downloadable practice materials. A month's access to the General Training Writing Task 1 course (12 hours). Everything you could ever want to know about IELTS Letters, including how to write letters that sound natural and satisfy all of the IELTS band descriptors. Plus, access to hundreds of downloadable practice activities. 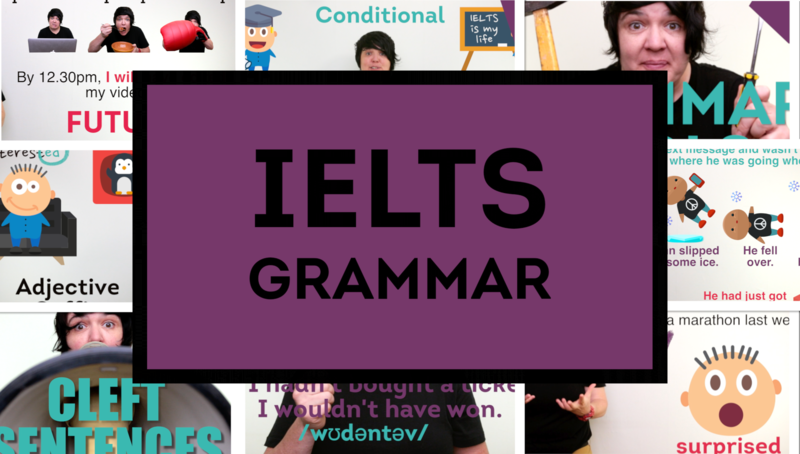 A month's access to the complete IELTS Grammar Course (9+ hours). Detailed lessons on 22 of the most useful sentence structures for IELTS test-takers - not just how to make them, but where to USE then. If you want to move from B2 to C1, this is the grammar course for you. 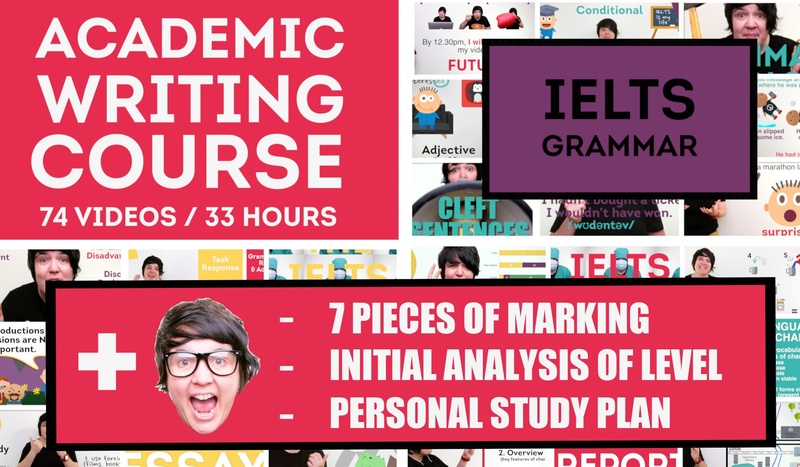 A month's access to all ACADEMIC writing videos: Writing Task 1, Writing Task 2 & IELTS Grammar (33 hours). This is the most detailed IELTS writing course ever created - 100% guaranteed! Every type of report and essay, plus the grammar structures you need to hit a 7.0 or higher. 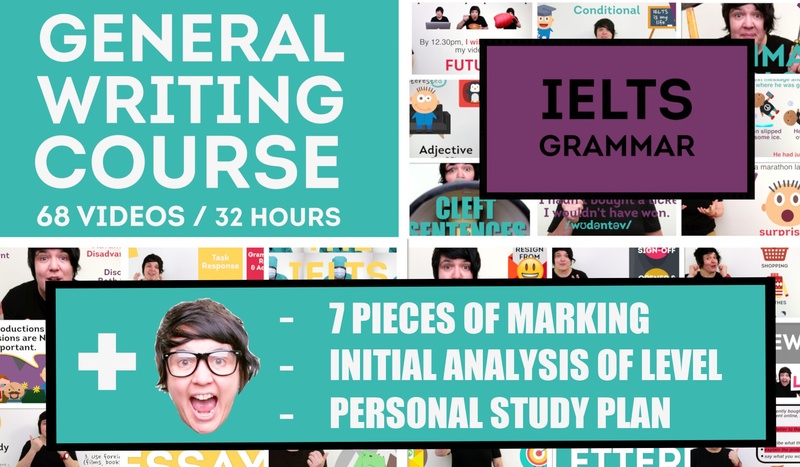 A month's access to all GENERAL TRAINING writing videos: Writing Task 1, Writing Task 2 & IELTS Grammar (32 hours). This is the most detailed IELTS writing course ever created, with lessons on every type of letter and essay, plus the grammar structures you need to hit a 7.0 or higher. Yes! This really is the full package! 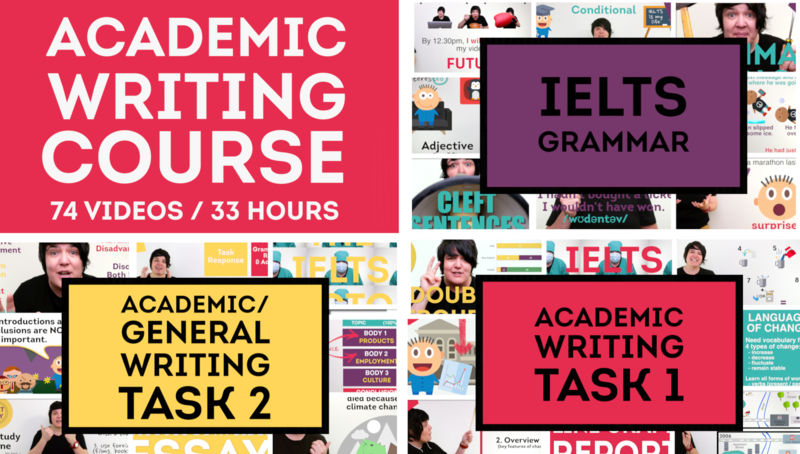 A month's access to all ACADEMIC writing videos: Writing Task 1, Writing Task 2 & IELTS Grammar (33 hours). Plus, an assessment of your level at the beginning of the course, a personalized study plan, and SEVEN pieces of marking. If you need to achieve a 7.0 or higher, then this really is the fastest way to exam day success. Yes! This is the full package! 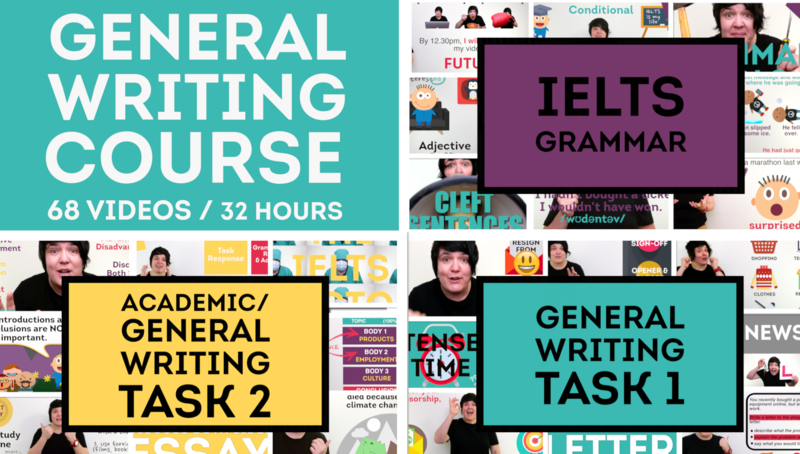 A month's access to all GENERAL TRAINING writing videos: Writing Task 1, Writing Task 2 & IELTS Grammar (32 hours). Plus, an assessment of your level at the beginning of the course, a personalized study plan, and SEVEN pieces of marking. If you need to achieve a 7.0 or higher, then this really is the fastest way to exam day success.